A mix of bold and simple ideas got people talking at Your Vision for Leith Walk the Open Space event organised by Greener Leith and Leith Open Space in Out of the Blue last week. Top votes went to the boldest idea – a Green Bridge – but there were many other ideas to improve life in Leith Walk which could appear on the ground much sooner. A Green Bridge – not just connecting cyclists and walkers with green spaces on either side of the busy street but also standing as an iconic tourist attraction in its own right – that’s bold! 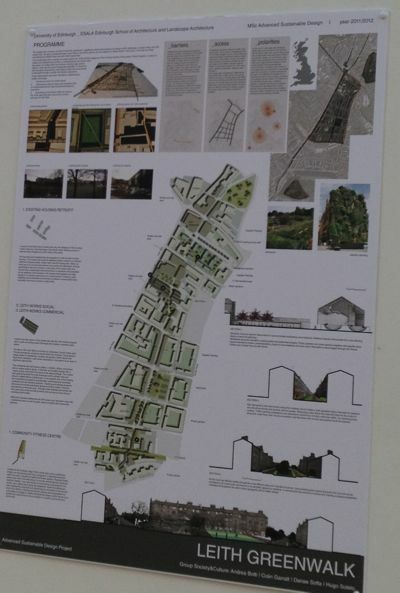 Designs by Leith-based architect Pierre Forissier and Edinburgh University architecture students set the scene for a lot of creative thinking. But the meeting of well over 50 local people – local residents and shop keepers, elected politicians and council officials, plus some local media – came up with many more ideas to improve life in Leith Walk. Some aim to make the street safer for cyclists and pedestrians, others to secure community amenities, ‘declutter’ the street, create a better environment for business… in other words, everyone wants to provide a better place to live, work and play. Different workshops produced strong arguments for street art, street markets, a register of local shop owners, better communication between council and community, a more flexible planning system to enable short term pop-up ventures…and free wifi. (you can see all these and more on Greener Leith’s excellent report with summary of the top 15 ideas). So much for words, what about actions? Since our meeting, Leith Walk Community Council have displayed the top 15 action points to gather more local views at Saturday’s Leith Festival Gala Day. Meanwhile discussion continues on the Leith Walk online voting forum created by Ally Tibbitt of Greener Leith. You can expect these ideas to influence existing plans. Discussions with Leith Neighbourhood Partnership and city councilors (who were at the Open Space meeting) are already happening. Bu t it is worth remembering the aims of the event. 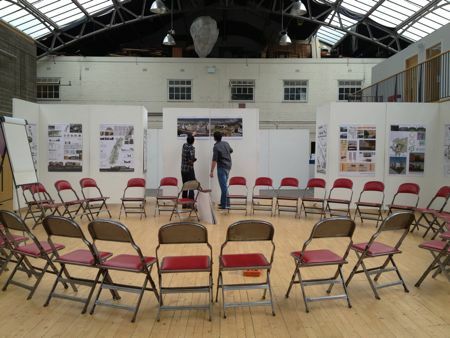 We invited local people to bring Your Vision for Leith Walk? hoping the event would represent the extraordinary diversity of Edinburgh’s most dynamic and multicultural street. In the week before the event we printed invitations and took to the street, visiting as many shops as we could – Chinese takeaways, Polish delicatessens, Pakistani grocers, Turkish tailors, Punjabi Women’s Kitchen, Scottish cafes, music shops and grocers – and they all welcomed us with interest and enthusiasm. Some doubted talking would make any difference but everyone agreed it was worth a try. Even so, many people were unable to join us last week. Many important questions remain, many voices are still unheard. That’s why the Leith Walk online forum offers another important opportunity to get involved. But not everyone is online and not everyone is on Twitter or Facebook. So Leith Open Space and Greener Leith will carry on finding ways to reach as many people as possible. We hope you will help us. Many thanks to our event facilitator Maggie Havergal, Leith Community Council, Edinburgh University Architecture Students and Pierre Forissier. 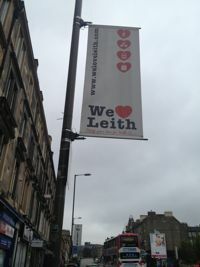 Previous Previous post: Your Vision for Leith Walk?